Does a dog suit your lifestyle? A dog is a fantastic buddy to cuddle, play with, walk or have around for company. It is important that you think carefully before you get a dog. Does a dog suit your lifestyle? Think about your family situation (children, other pets, etc.) and your home. Do you have enough time to take care of a dog? Can you afford to offer the dog the appropriate care? Where will the dog go when you go on holiday? These are all things to consider when you think of getting a dog. Taking care of a dog takes a lot time, and you will always have to factor your dog into your decisions. Your dog will be a member of your family. Every dog will need to be taken for a walk several times a day, even when it's raining. On average, you will need to spend 1 to 2 hours a day making sure that your dog gets enough exercise, partly depending on its breed. In addition, dogs need to be fed, brushed, etc. at set times. You should also bear in mind that dogs are not permitted everywhere. This may affect your daily activities, but dogs can also give your life rhythm and comfort. When getting a puppy, it is important that you think carefully about the breed (and the character that comes with it), the dog's size and your reason for getting a dog. What do you expect from your dog? Do you want a dog to go on long walks with, a dog that likes children, a dog to play sports with (hunting, agility, tracking, protection work, etc. ), a watchful dog or just one that will lie on the sofa with you? It is essential that you choose a dog with characteristics that suit you, rather than one that looks pretty. The breed says a lot about the dog's character, size and required care. For example, a working dog will need plenty of physical and mental exercise. A large dog needs more space to move around than a small dog. The breed also determines whether the dog needs any extra care, such as coat care. If you have children, it is important that you choose a trustworthy dog. In addition, the appearance of the dog also plays a big role. Don't forget that certain physical traits can also have an impact on the dog's health, and may lead to the dog having extra care requirements and/or limitations. You can find a description of the characteristics of every breed of dog online. When you look at the dog's original purpose, this can also give you an idea of its character. For example, Bouviers were traditionally bred as guard dogs and for herding, which can still be seen in the breed's character. 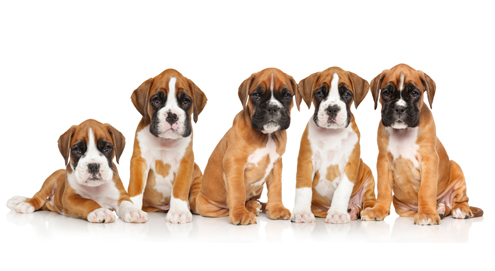 Make sure that you purchase your puppy from a reliable breeder. Pay attention to health, breeding method and behaviour (including that of the parent animals!). It is important that the puppies have a passport and have had their worming treatment, vaccinations and chips. It is also important that they have a clean nest and that the mother dog is present. Please ensure that the breeder is consciously working on socialising the puppies and doesn't have too many litters at once. Unfortunately, puppies (that are too young to leave their mothers) are also illegally imported from abroad with fake passports these days. If in doubt, do not buy the puppy. You have chosen your puppy, but what do you actually need to know about its healthcare? Every puppy needs a basic vaccination schedule to help build up an immunity against a number of life-threatening and contagious diseases (canine distemper, hepatitis, parvo viruses, leptospirosis). The schedule that is used for this recommends vaccinating the puppy at the age of 6, 9 and 12 weeks. These days, you can also determine the level of antibodies to disease in the blood through the so-called titer test, and you can get customised vaccination advice based on this. In addition to vaccinations, your puppy should also receive regular worming treatments. It is recommended that you give your puppies worming treatments at 2, 4, 6 and 8 weeks and repeat this monthly after that until the dog is 6 months old. It is then sufficient to worm your dog 4 times a year, or create a tailored schedule based on a faecal examination. In the category worming treatment for puppies, you will find all worming treatment products for puppies. It is important that you offer your dog high-quality food in the first year of its life, a good choice would be Royal Canin puppy food. This will allow you to meet the nutritional requirements of the young, growing dog. For large dog breeds (adult weight >25 kg), you need to choose a food that is suitable for large breed puppies, due to the calcium-phosphorus proportions in the food. A large breed puppy shouldn't grow too quickly, as this can lead to problems with growing pains and bone structure. You can get insurance for your pet. This can help you cover the cost of any treatment by your veterinarian. You can look into the various insurance companies and compare premiums and terms and conditions. You can also choose to create a "piggy bank" for your dog, to cover unexpected costs such as surgery and emergencies. What do you need for your puppy? In order to provide for your dog's basic needs, a safe sleeping place and a good food and water bowl are essential. The Pawise Wire Dog Crate or Boon 2-door Crate (both which can be found on our website), are ideal tools for training your dog. You can read more about this below. A crate is also a way of creating a safe environment for your puppy. This allows the puppy to retreat to its safe place and relax. When buying a crate, make sure you choose the right size, so that your dog can move around freely. You can buy a pillow that fits in the crate such as the Scruffs Expedition mat to create a lovely place for your dog to sleep. Vetsend also offers you a wide range of water bowls and food bowls. For puppies that eat too quickly, it is wise to purchase a so-called slow feeder. In addition, you also need a collar or harness and matching lead, such as the Puppia Two Tone Lead and Puppia harness. Toys are also essential. Make sure that the toys are made of sturdy material and that your dog cannot swallow any components. Never allow your dog to play with the toy unsupervised. The crate is a useful tool for training your dog. Get your puppy used to the crate quickly. This training starts on the first day that you bring your puppy home. Try to make the crate a pleasant environment. You can give the puppy its food and treats in the crate, for example. As soon as the puppy falls asleep somewhere, you can carefully place him in the crate. When your puppy is in the crate, it is important that you leave it alone. If you have children, make sure they know not to stroke the dog or take it out of the crate when it is resting. This teaches the puppy that the crate is a nice and safe place for him. Gradually leave the dog in the crate for longer when it wakes up. Only get the dog out of the crate when it is quiet and try to ignore any crying. When the puppy is used to the crate, you can slowly leave it for short periods of time. Come back into the room when the dog is quiet and reward it. You can build this up gradually by staying away a little longer each time. Never use the crate as a punishment! The first nights can be quite scary for puppies. They are sleeping alone in an unknown environment for the first time. To make your puppy as comfortable as possible, you can choose to sleep next to the crate or put the crate next to your own bed. The puppy will feel better when it knows that you are near, and you can respond quickly if the dog needs to go out to pee in the night. There are special cuddly toys available to support puppies. One example of these is the Snuggle Puppy. This soft toy has a beating heart that your puppy can feel and contains a heat source that puppies can snuggle up to and which soothes them. One of the first things to train your dog in is house training. Puppies can't hold their pee for very long and generally need to go outside every 2 hours. You should definitely take your puppy outside immediately after eating/drinking, sleeping and playing. Give the puppy a chance to do its business and when it does, give it plenty of rewards (using treats or praise). Also keep a close eye on your puppy indoors. If your puppy starts turning on the spot and sniffing a spot, it probably needs to do its business. Take your puppy straight outside. Try to prevent "accidents" in the house. If you can't supervise your puppy for a short time, put it in the crate, as he will not want to soil it. Should your puppy do its business in the house, do not punish it, as this can have an adverse effect. If your dog is used to peeing on puppy pads, you can use Duvo+ Pet Toilet or Duvo+ Puppy pads available at Vetsend. Gradually place it closer to the door and eventually remove them. In the first period, the puppy will also need to do its business at night. Put your puppy in the crate and when it gets restless or indicates that it wants to get out, you can take it outside to give it the opportunity to do its business. As it gets older, it will be able to hold it for longer and longer periods. Dogs love a mental challenge. They like to have to "work" for their food. This can even be a reward and prevents boredom. There are various products on the market to mentally stimulate your dog. These include puzzles such as the Trixie dog activity flip board, Nina Ottoson dog domino and fill-able toys such as Kong Classic that you can hide food in. It is a good idea to go to puppy training with your dog. Aside from socialising your puppy, it is important that you work together, create a bond and learn basic commands. This is not only important when you want to get out more with your dog, but also when you want a nice, obedient dog at home. During dog training, you are guided and helped with this. After puppy training, further training is usually offered to extend the training. There is a wide variety of activities and dog sports for dogs and owners. You can find something fun for every dog and owner! Soft toy with a heat source & beating heart. For puppies with digestive and gastrointestinal disorders. Sturdy, collapsible crate for home or travelling. Foldable crate to use at home or while travelling.